Bill Valavanis trusted me with this Hinoki Cypress, the tree was simply too tall and the style was lost, having previously worked by Corin Tomlinson a few years ago my job was to bring the tree back on track. I pre-wired most of the lower branches in the morning prior to the demo that took place at noon. This is because watching somebody wire a tree for a couple of hours is frankly mind numbing. I attempted to create some drama with the upper part of the tree by making a twisted jin, this works superbly on green wood however the heartwood of the tree was too stiff making the bending impossible. I noted at the start of the demo that it may well be cut off if the technique was not successful. I was very pleased that the finished tree made a record figure in the Auction at the end of the event. 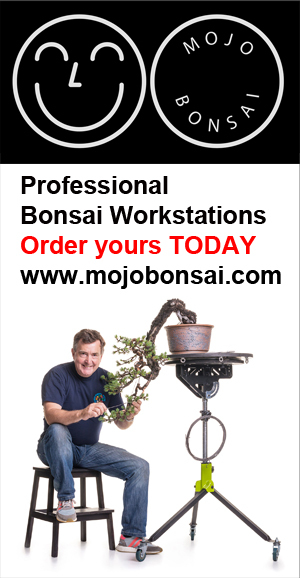 Thanks to Bonsai Empire for recording the demo, take a look at their website here, its full of great content.